Review copies of Madden NFL 13 arrived today. EA Sports usually sends out funny premiums with its review guides, like it did with a yardage book for Tiger Woods PGA Tour 13. 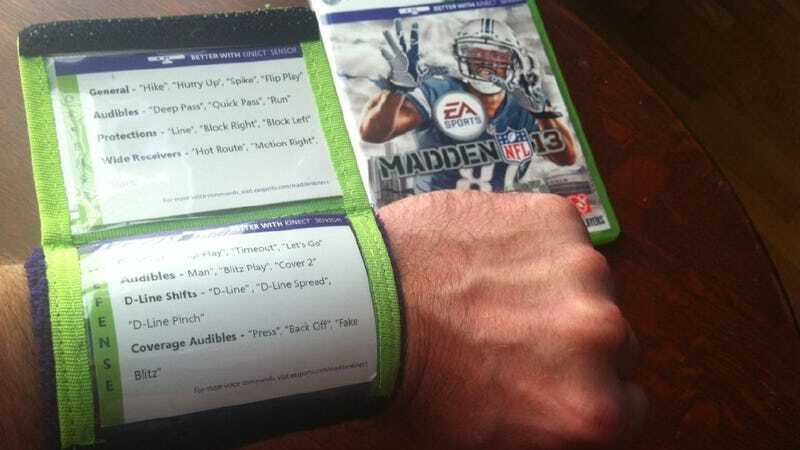 This year, they included a quarterback wristband—the kind you see Peyton Manning or Aaron Rodgers flipping up and staring at during a two-minute drill—to highlight the new audible commands for the Kinect-enabled version of the game. It's rather clever, as I'm having a tough time grasping the full vocabulary available for making pre-snap adjustments (there are more than 120 commands you can give). This may not be as handy as my Cooking Mama oven mitt but it's still a useful piece of swag. Especially when I apply it to one of my favorite games.